Home » Events and Blogs » Blog » Food Overload! Have you ever overeaten? It’s not pleasant is it? 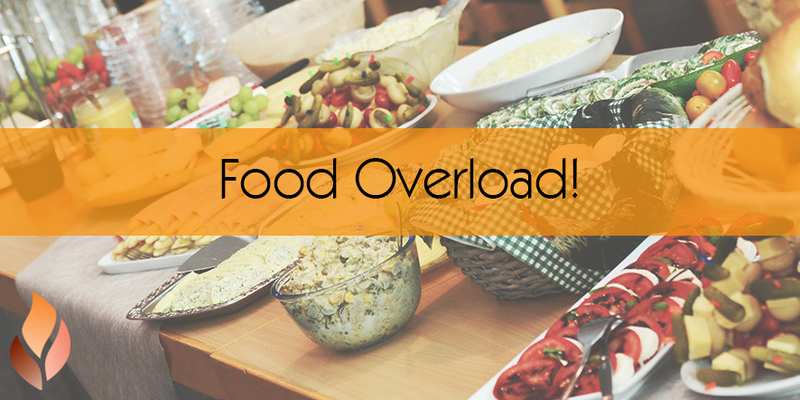 You eat so much that you feel physically unwell resulting in feel tired and sluggish, hot, sweaty and even dizzy! So why does your body react like this? Well, when food hits our stomach and begins to stretch, signals are sent in the form of chemical messengers to our brain’s appetite centre to reduce our sense of hunger and make us feel full. If we keep eating beyond just feeling satisfied these signals get louder and louder to the point where we simply can’t eat a single bite more. At the same time signals are sent to our heart and blood vessels to increase blood flow to our stomach and digestive organs to start breaking down the food we have eaten. Our heart rate goes up as a result and so does our metabolism in order to try and burn off some of the calories. This can make us feel hot and sweaty and even occasionally dizzy. If we continually overeat we can stretch our stomach walls which means that it takes more food than previously for us to feel full. Firstly, don’t berate or criticise yourself for overeating. We all do it from time to time. Guilt can make you overeat even more. The same goes for overcompensating for overeating by exercising. Doing some daily exercise is important but ‘punishing’ yourself for overeating by exercising will make it more likely that you will continue a cycle of binge eating. Instead keep in mind that moderation and consistency is key to exercise and healthy eating. After we have overeaten oftentimes we plan to not eat very much the next day. The problem with this is inevitably we will feel hungry, usually towards the end of the day, and this can cause us to overeat once again in the evenings. The better approach is to continue to eat sensibly throughout the day by having regular meals and snacks. Fill up on plenty of fresh fruits and vegetables and avoid processed foods which can easily be overeaten. Lastly, remember that there are no ‘quick fixes’ to remedying overeating. No detox or cleanse will take away the overeaten food or effects of the food on our bodies. It is best to just think of occasional overeating as part of life and to continue to mostly eat sensibly. If you find that you are repeatedly overeating then this is best supported by a health professional as there may be an underlying physical or emotional reason why you’re doing so.